Recently, my husband and I went to visit some friends in Grand Rapids who were celebrating their 10 year wedding anniversary. If that doesn’t make you feel old, nothing will. We left our dog at home, but several of the other guests brought theirs. They were all varying degrees of small, but the smallest was my friend’s Yorkie; who tried in vain to keep up with the other dogs as they raced around the yard. I couldn’t help but smile and feel sorta bad for the little guy. He reminded me so much of myself as a child; always struggling to keep up, but no matter how hard I tried, I was always just a fraction too late. In other posts, I have credited my sister with inadvertently teaching me how to be independent. It was, after all, my struggle to keep up with her that inspired my parents and I to make adaptations where necessary and come up with new ways for me to do otherwise simple things. I have already told the story of the bicycle, but watching that Yorkie running feverishly about the yard reminded me of the scooter at my Grandma’s house. As it turns out, not only could I use this scooter, but was actually so good at that I had others struggled to keep up with me for a change. 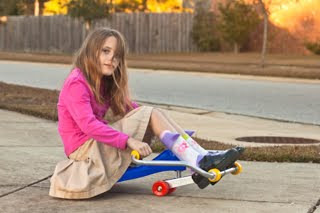 Let’s face it, toys such as tricycles, bicycles, scooters, and rollerblades are not geared towards kids with disabilities. And yet, kids with disabilities want nothing more than to go zooming around with their friends. The Roller Racer is one of the few toys I could use without special adaptations as a child (aside from the Power Wheels my cousins had, which I used to run over my sister). This scooter was great because you used it while sitting down. There was a wide base and you were super low to the ground, this made it really easy to get on and off of independently. The best part for me was that it could be operated with one or both of my arms. I remember the first time I got on it, thinking that Mom or Dad would have to push me around like everything else; I was overjoyed when I realized I could do it myself. The Roller Racer was my first taste of real independence. Walking at that age was still hard and slow going, and I didn’t have a wheelchair. But with this scooter I felt like I was unstoppable! These, of course, were the days when the end of the street felt like miles. Obviously this scooter is not the answer for truly independent mobility, but it you have a kid that wants nothing more than to zip around the neighborhood with friends, then you really should give with a try. I’m not the only one that thinks so. It has made it onto several lists of toys for kids with disabilities. Heck, I turned out to be a small adult; part of me wants to order one for myself just to recapture that joy.